Tout Daily Archives | TOUT WARS! It’s all Todd Zola and Derek Carty tonight, as it has been all season. We’ll update with the final results in the morning. 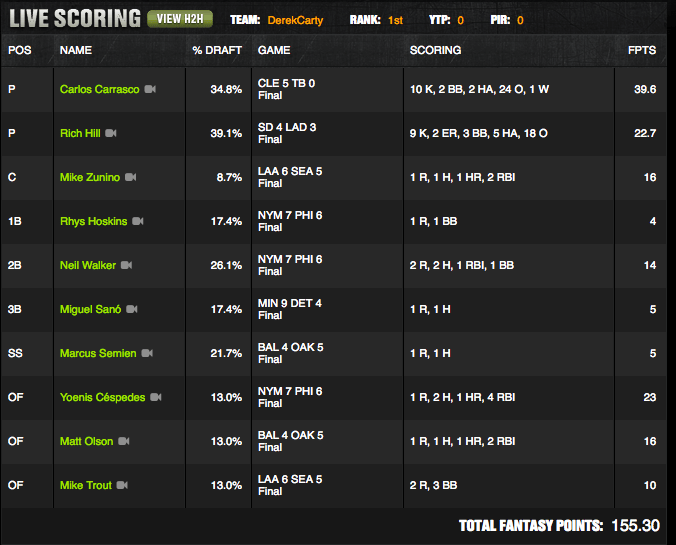 UPDATE: Derek Carty is Tout Wars champion. At midnight Carty emailed the league: Man, we’ve really got a sweat going on here. Can we end the games now and just call it? It was that close between the three teams of Zola’s and two of Carty’s, but when the evening was done Carty had held on. Here are the final standings (and Carty is already working on the sandwich that will be named after in at the Foley’s NY dinner on Tout Weekend 2018). Tout Daily 2017 Finals Are Set! The final night of the 2017 regular season went to Jeff Boggis, but as the night’s games finished two winners emerged in Period 5 of the contest: Derek Carty and Tim Heaney. Each adds a ticket to the finals, to be held next Friday, September 1 on Draft Kings. Todd Zola has three. He also won the Most Overall Points ticket by three points over Derek Carty. Derek Carty has two tickets. Good luck to the finalists on September 1. Tout Wars Daily Period 5 Week 4 Tonight! Derek Carty leads for a second golden ticket, but there is a crowd chasing him. See the leaderboard here, and look for the winners of the last three tickets in this space on Saturday. Tout Daily Period 5: Halfway Home! Tim Heaney did not finish in the Top 5 in Week 2 of Tout Daily Period 5, but remains atop the leaderboard by virtue of his Week 1 margin of victory. But right behind him are Steve Gardner and Ray Murphy, each looking for a Top 2 finish in the four week contest and a ticket to the September 1 finals. 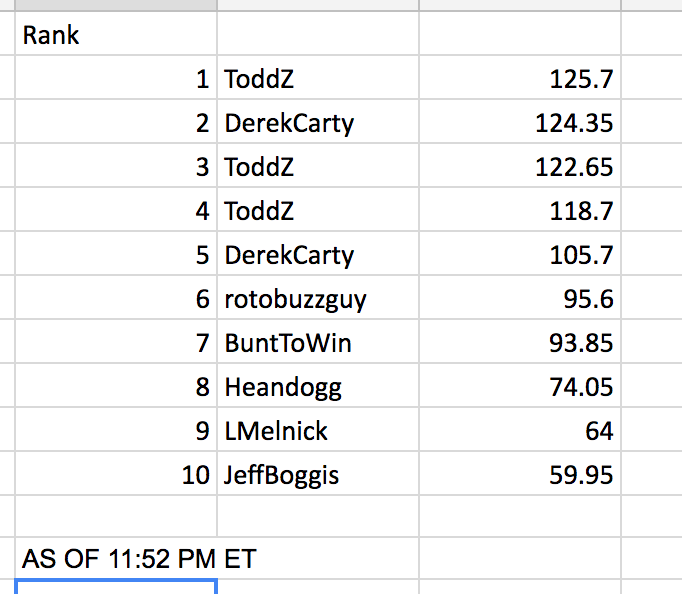 Sitting in fourth place is Week 2 winner Derek Carty, who—along with Derek VanRiper and Todd Zola—is within shouting distance with two weeks to go. Carty’s victory was built on the backs of Carlos Carrasco and Rich Hill, popular pitching picks who had fine nights, and strong hitting across the board, with Yoenis Cespedes leading the way. The Touts will be back this coming Friday for Week 3. Look for their picks for Draft Kings that night late on Friday afternoon. Tim Heaney Rules Week 1 of the Final Period in Tout Daily. 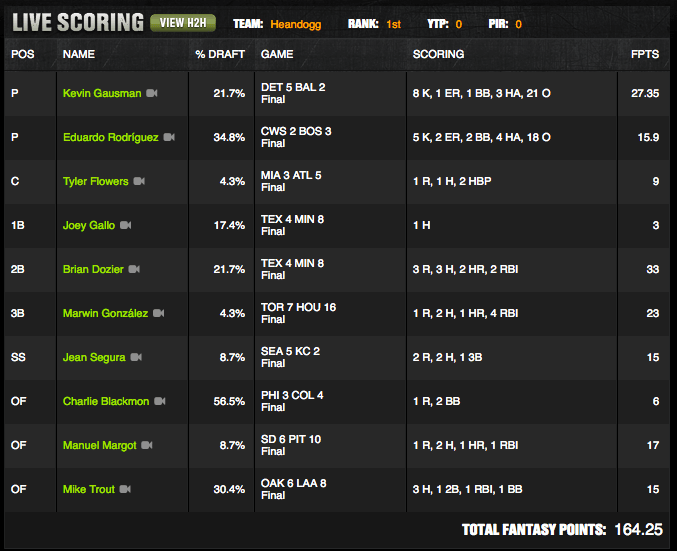 Tim Heaney got off to a strong start in the final period of Tout Daily last night. Strong performances from popular choices Kevin Gausman and Brian Dozier, and strong performances from not popular choices like Marwin Gonzalez and Manuel Margot, added up to an easy victory on the night. Second and third place were claimed by Jeff Erickson, who already has a ticket to the finals, and Ray Murphy, who finished just .55 points apart. The top five was rounded out by Andrea LaMont and Steve Gardner. 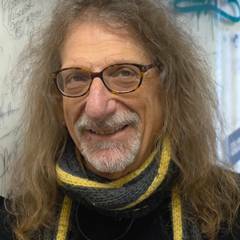 LaMont’s strong week moved into second place in overall points for the contest, where she challenges leader Todd Zola for a bonus ticket to the September 1 finals. We’ll follow that race closely in the coming weeks. You can see the whole leader board here. The Final Period: Tout Daily Picks Tonight! Four periods are done. 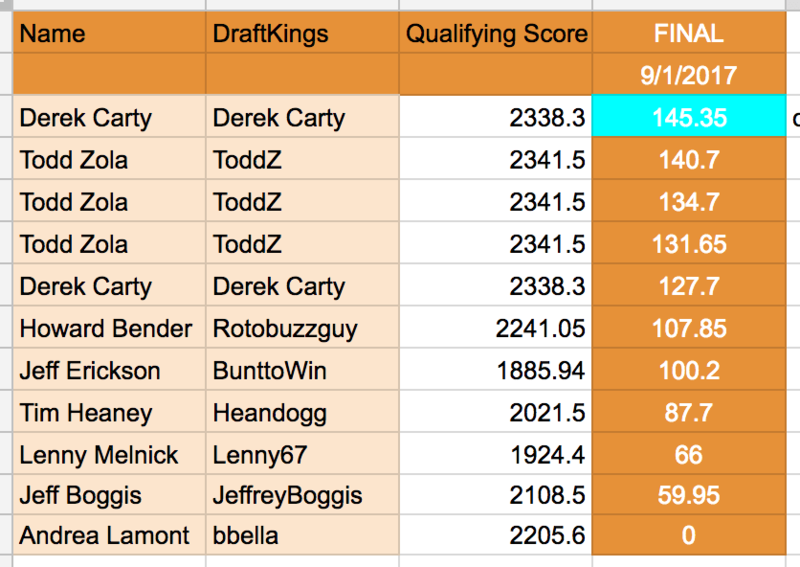 Seven Touts have eight tickets to the September 1 Tout Daily Finals at Draft Kings. We can name them: Todd Zola has two tickets. Andrea LaMont, Derek Carty, Howard Bender, Lenny Melnick, Jeff Boggis and Jeff Erickson have one apiece. Tickets will be awarded to the first and second place finishers in Period 5, and an 11th ticket will be awarded to the tout who scores the most points over the contest’s 20 weeks. Right now Zola has a 50 point lead over Carty for that bonus ticket. For tonight, we have picks for tonight’s contests at Draft Kings. Top pitchers…going on the cheap side again with Jamie Garcia, making his Yankee debut at Cleveland. This will be bust or boom, as the Indians could pound him and he’ll be gone by the third, or as I’m hoping, he turns in one of those unexpected performances like he did in St. Louis many times. Top Hitters…stacking Colorado, why not? Reynolds, Arenado, Story and Freeland (although I’ll get 0 points for his hitting). Also hot hitters Upton, Sanchez, Revere and Altuve. I’m going with Madison Bumgarner and Evan Longoria. My top hitter for tonight’s #ToutDaily contest is: Andrew McCutchen ($5,400 OF-PIT) versus San Diego. Andrew McCutchen is hitting .265/.409/.559 with three home runs and nine RBI against Travis Wood in his career, and owns a 1.292 OPS against left-handed pitching this season. There is a 72% chance of rain tonight, so check your lineup prior to 7 PM tonight to make sure that the game is not postponed. My top pitcher for tonight’s #ToutDaily contest is: Madison Bumgarner ($11,300 SP) versus Arizona. Back from the DL, de was terrific in Sunday’s no-decision against the Dodgers, allowing just five hits and a walk over seven shutout frames. Yu Darvish ($11,100): Darvish has certainly been dominant with 148 strikeouts over 137 frames, allowing just a .225 opposition batting average, and the Mets have not seen much of him. Elvis Andrus ($4600): Low price tag for a guy with a .290-15-46 line hitting atop the order, but Andrus also gets to face Bartolo Colon, and that should be fun for the entire Rangers team. Kevin Gausman: No pitching in baseball has been hotter in his last three starts except maybe the Klubot. Kevin Gausman comes with a $4,000+ savings over Paxton or DeGrom. He has struck out 24 hitters in the last three games in only 20 2/3 innings pitched. He averages 30 DraftKing points a game in those three contests. That is FILTHY. Tim Beckham: Love to ride the hot hitters, especially at off positions. Tim Beckham has an OPS of 1.356 over the past 7 days. He has settled into the Orioles lineup nicely. He homered last night and is 7 for 12 with 5 EXB hits since joining the Os. He will continue that tonight as the implied runs for the Os is greater than five. Ride the hot hand. That means two things. PITCHER Still waffling, especially since I’d love to use Ivan Nova but the weather looks risky. I reserve the right to change my mind, but currently my lean is Madison Bumgarner hosting the DBacks in AT&T. I like using an ace and even though Arizona is dangerous, the park helps a bit. HITTER Jaime Garcia has done a reasonable job keeping the ball in the yard, but it’s rare finding a top power hitter, with the platoon edge priced as cheaply as Edwin Encarnacion ($4200). My only concern is I don’t like using one-offs against a team with a good bullpen and I’m not sure if I’m going with a full Tribe stack. Pitcher – outstanding Ks continue from Brad Peacock, with a much better than average chance at a Win vs. the Blue Jays. Hitter – Adrian Beltre is rarely a bad bet; certainly not against what’s left of Bart Colon.